As part of our recently published HTA review we assessed the effect of oseltamivir on mortality in 2009A/H1N1 influenza patients. (See Chapter 3, page 99 Neuraminidase inhibitors for influenza: a systematic review and meta-analysis of regulatory and mortality data. Health Technol Assess 2016; 20 (42). To do this we did a systematic review and individual patient data meta-analysis of observational studies. We included 2009A/H1N1 influenza patients reporting mortality outcomes and exposure to oseltamivir with at least 5% of patients untreated with influenza antivirals and five or more deaths overall. A pre publication protocol outlining our proposed study was also registered at Prospero. None of the deaths was in a patient with confirmed influenza. 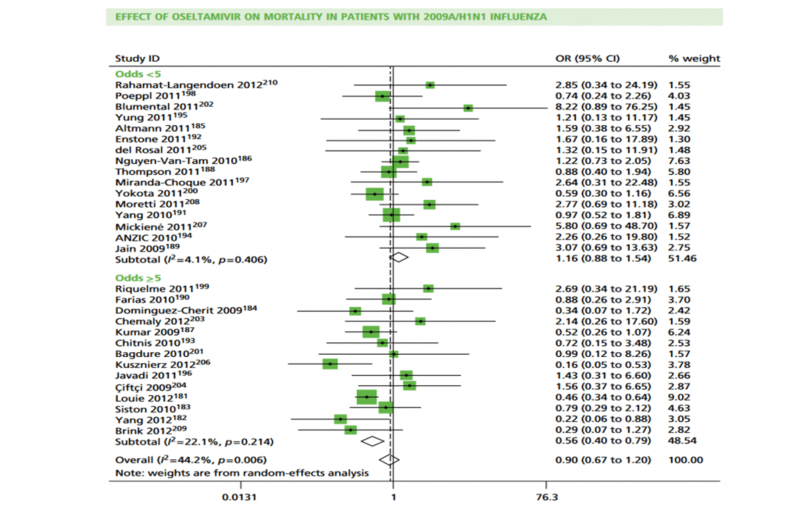 We found insufficient evidence from 30 observational studies to support oseltamivir having a protective effect on 2009A/H1N1 influenza patients for mortality. From a total of 1117 studies we included 30 observational studies of hospitalised patients including 11,013 patients. The percentage of deaths receiving oseltamivir was similar to that of survivors (83% vs. 82%). We found evidence of time-dependent bias in the summary data and the IPD. IPD came from four studies including 3,071 patients and 242 (8%) deaths. After taking account of time-dependent bias, potential confounding variables, and the competing risk of hospital discharge, analysis of IPD showed oseltamivir did not reduce the risk of mortality, HR 1.03 (95% CI 0.64 to 1.65). 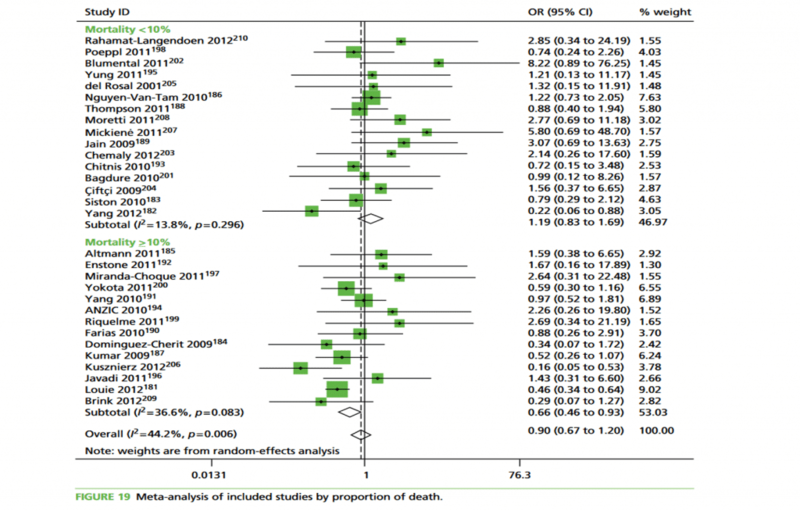 Results showed no effect of age group (p=0.40) or severity of illness (p=0.38), but evidence of aneffect of log-odds of death (p=0.024) when, as odds of death increases, the treatment effect in favour ofoseltamivir increases, and log-odds of treatment (p=0.003), when, as odds of treatment increases, the treatment effect in favour of oseltamivir increases. These effects appear to be independent as p-values in multivariable analysis are 0.031 and 0.006, respectively. ‘<5’ compared with ‘≥5’ and percentage of death: ‘<10%’ compared with ‘≥10%’ . An odds of treatment of ‘≥5’ equates to a percentage of≥83.3%. Results show treatment effect is in favour of oseltamivir and more heterogeneous in cohorts when odds of treatment were‘≥ 5’. Conversely, in cohorts for which odds were‘<5’,heterogeneity is smaller and overall effect is in favour of no treatment (Figure 18 in from Health Technol Assess 2016; 20 (42).HTA review shown ). Missing data were more common in patients with less-severe disease, whereas other studies reported complete information. A number of the included studies conducted analyses adjusting for potential confounding variables, such as patient comorbidities, they used logistic regression or standard survival analysis, which may not be appropriate for observational studies in which treatment exposure is time dependent. This type of analysis misallocates the time from initiation of the study (e.g. hospital admission) to start of antiviral treatment and leads to time-dependent bias. See Beyersmann et al. for more on this important methodological issue. See also Appendix 15 (page 229) “Illustration of time-dependent bias using individual patient data from the Canadian study”for a detailed description and example of time-dependent bias. The percentages of missing data were smaller for the deaths than the survivors (0.4% vs. 36% for time to death/discharge for example), suggesting that data collection was more thorough for patients who died. Reasons for non-treatment with antivirals were not provided and none of the studies described a policy or criteria used for selecting patients for treatment. There were missing data for time to death/discharge and time to treatment (33% and 10% missing, respectively) in the four studies for which we had IPD. The majority of missing data for time to death/discharge was due to one study that did not report date of discharge for survivors. The HTA systematic review found insufficient evidence that oseltamivir is associated with a reduced risk of mortality. Figures see chapter 3 page 99, Health Technol Assess 2016; 20 (42).